Today is a significant day. It is the first day in over twelve months that I haven’t had a production to think about – and don’t know exactly what my next project will be. It feels nice to relax -fun and rewarding as theatre is, it is also highly challenging and stressful – and a short break will give me chance to decide exactly what I want to do next. 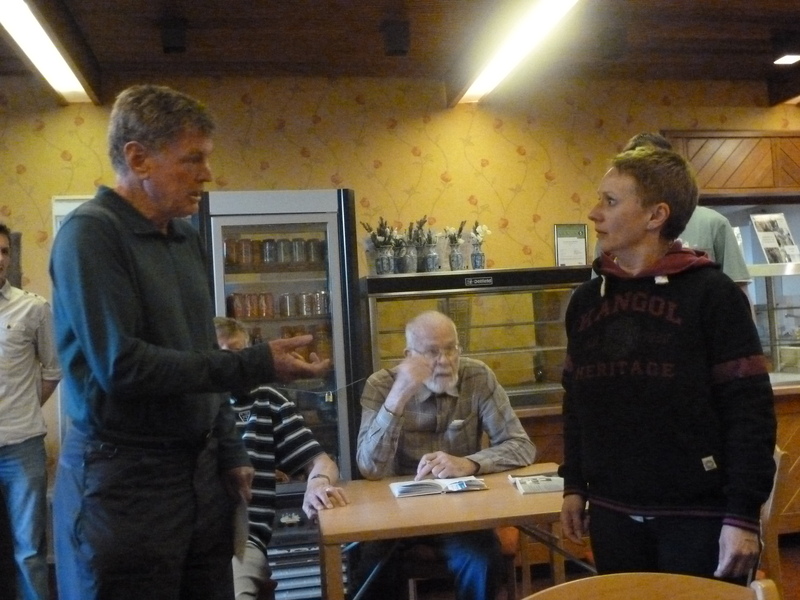 The emphasis is on short, though – I have lots of ideas and several applications in and imminent, so will be itching to get going on new projects and productions very soon. So, it’s a good time to review. The easiest way is through pictures of the main productions which have happened in 2012. It means missing out the various workshops – one of which was mentioned in A Review- Part 1; the reading of a verbatim text devised by a local writer, which happened at The Dukes with a range of theatre professionals – a gathering which focussed on a new actor-centred approach to new writing which is being piloted in various places; the fun I had leading the audience around a castle for a local theatre company’s production of Much Ado About Nothing; the Litfest Mystery Launch – it was such a hectic time (detailed in earlier blog posts) that I didn’t have time to arrange – or take – photographs; and the recording of All The World’s A Stage for an Australian online festival (though a link to part of that recording can be found at www.vimeo.com/channels/elartproductions ). Despite the omissions, though, I hope it gives a real flavour of what 2012 has been about. Things started properly early in March, when The Dukes flatteringly asked me to revive All The World’s A Stage as part of a city-wide Shakespeare Festival. A couple of the original actors were unavailable, so we took the opportunity to adapt and revise, culminating in The Play’s The Thing! 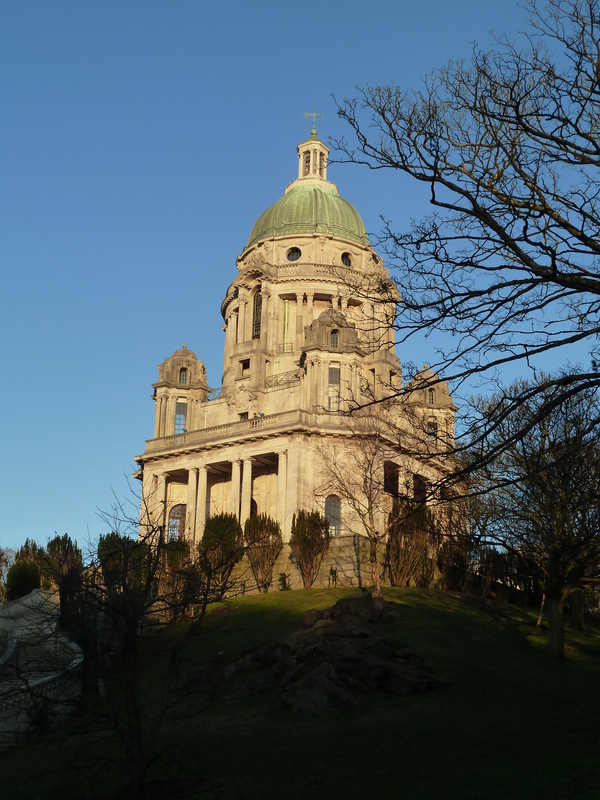 which was performed at The Ashton Memorial. 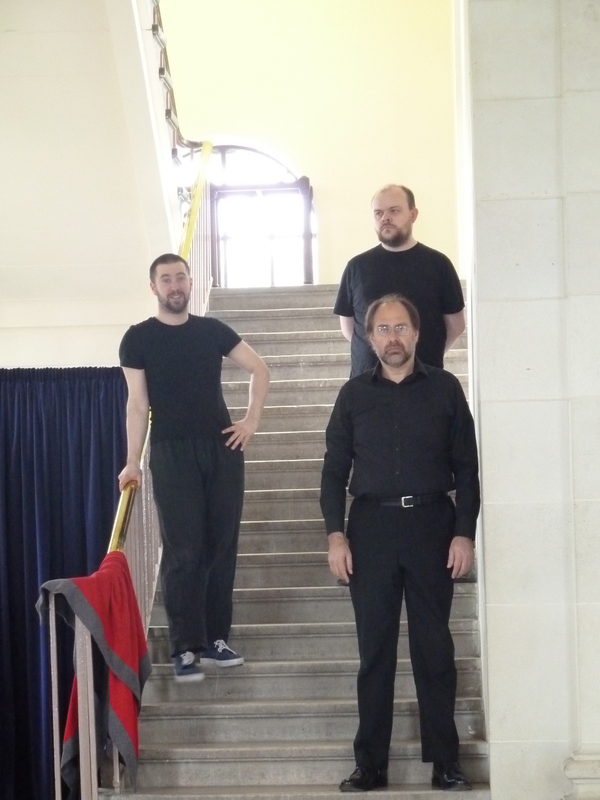 The acoustics in the building were very strange, but some wonderful effects were achieved by using the stairs. With playing and hard rehearsal, we finally cracked the overall acoustic too. As an all-male cast, one of the real challenges of The Play’s The Thing was producing serious scenes involving female characters. 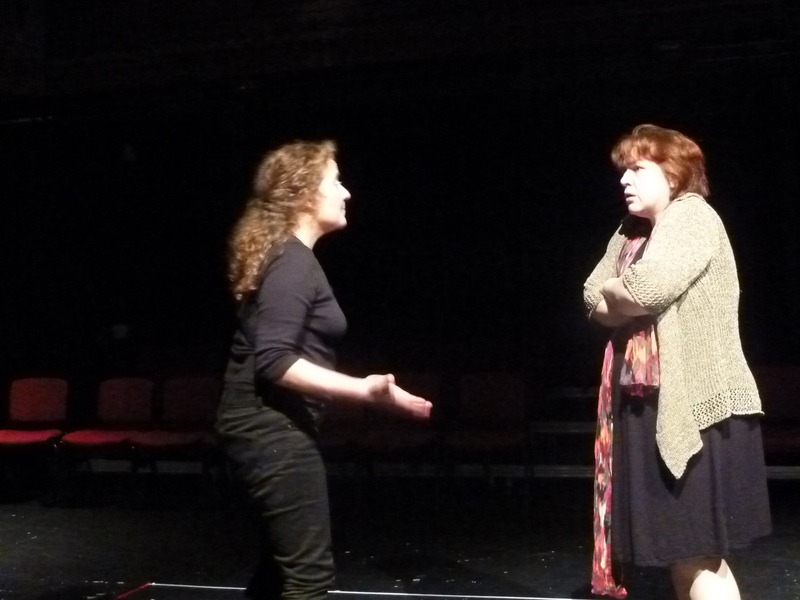 This scene – Lord Capulet berating Juliet – worked beautifully. 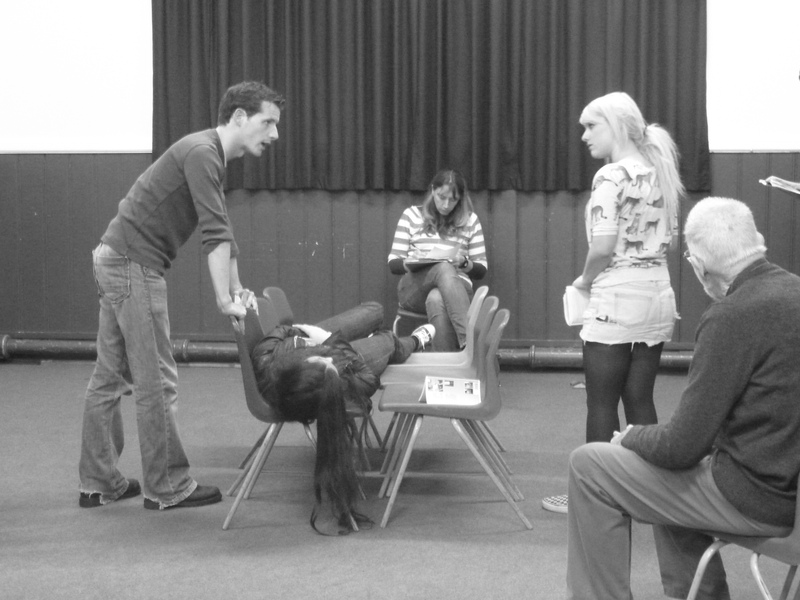 The whole cast made me laugh in Pyramus and Thisbe. 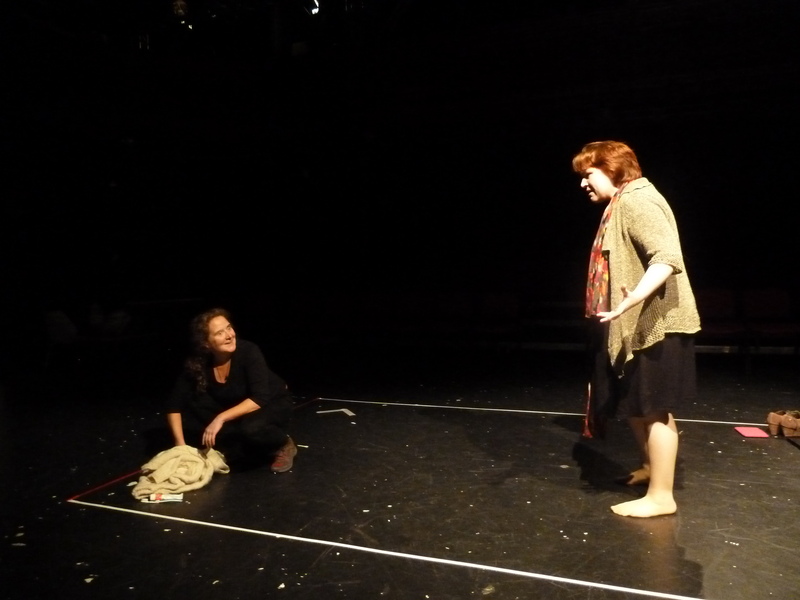 This is a tiny moment when Pyramus and Thisbe whisper through Wall’s chink. The amazing venue of The Play’s The Thing from the outside. The Play’s The Thing! 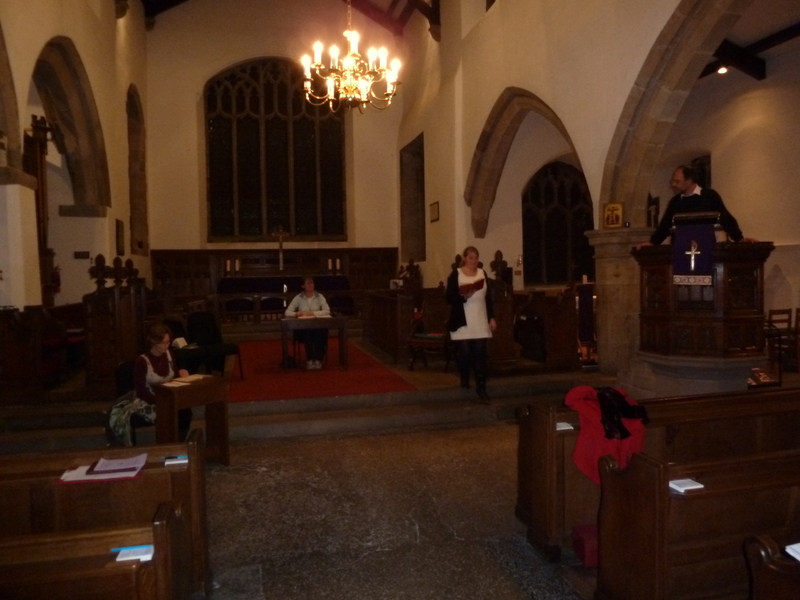 was swiftly followed by The Vigil, a community production in a lovely village church. 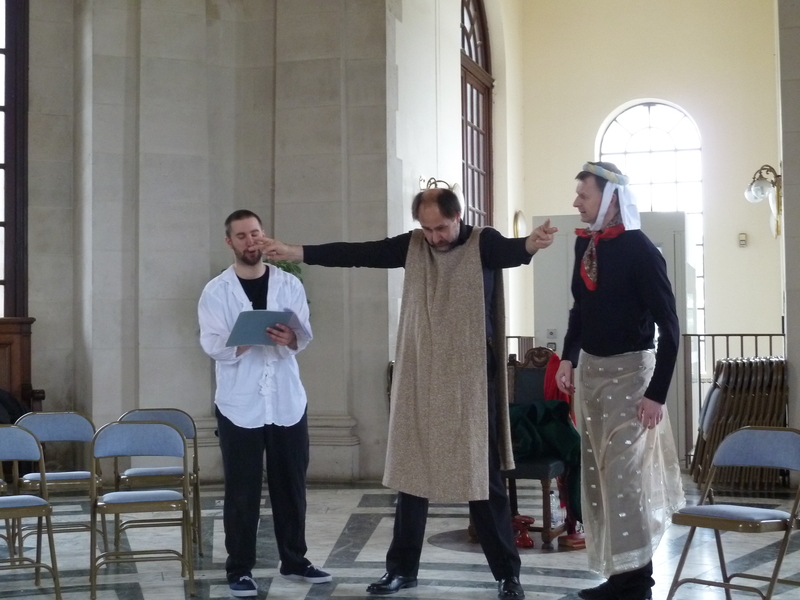 The Vigil by Ladislas Fodor re-tells the Christian Easter story as a courtroom drama, with the gardener on trial for snatching the body of Jesus. 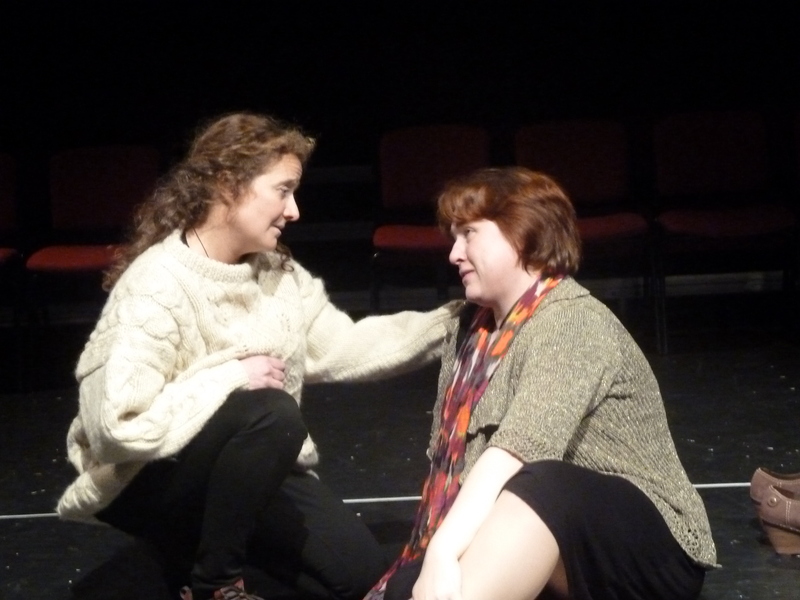 The production was moving and hugely enjoyable and it played to extremely receptive audiences. For various reasons, I found myself acting and directing, something I greatly prefer to avoid, but in this case it seemed to work out satisfactorily. 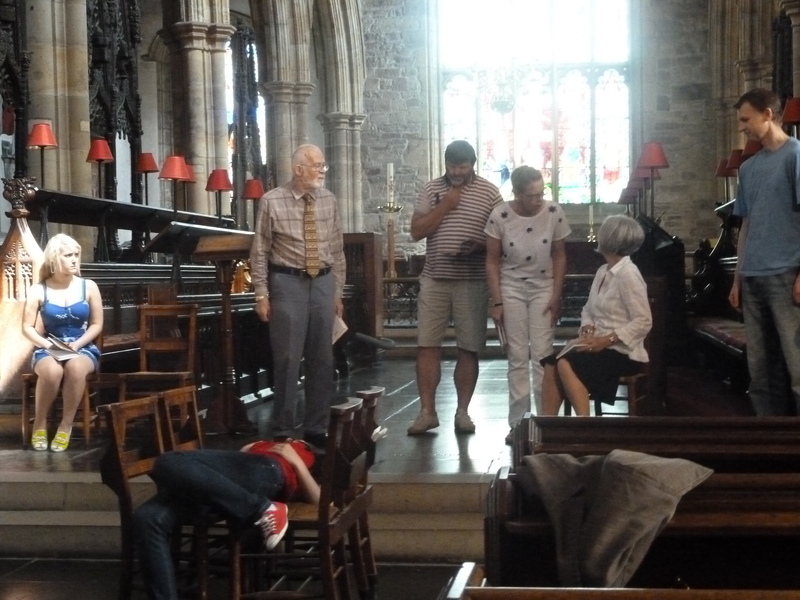 Rehearsing The Vigil by Ladislas Fodor in a lovely village church was a joy. It was amazing how well the church suited the courtroom set and the pulpit was a fantastic dock. 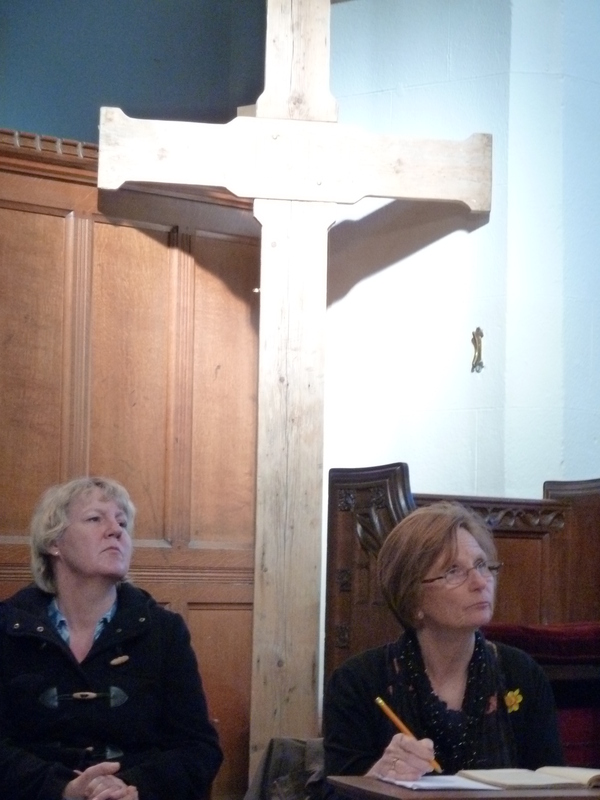 Using some of the church features suited the message of The Vigil very well. Next came The Crucible (detailed heavily earlier in this blog). I loved this production so much, that I’m going to indulge myself with a number of photos – tirelessly taken at rehearsals by a friend and member of the cast. 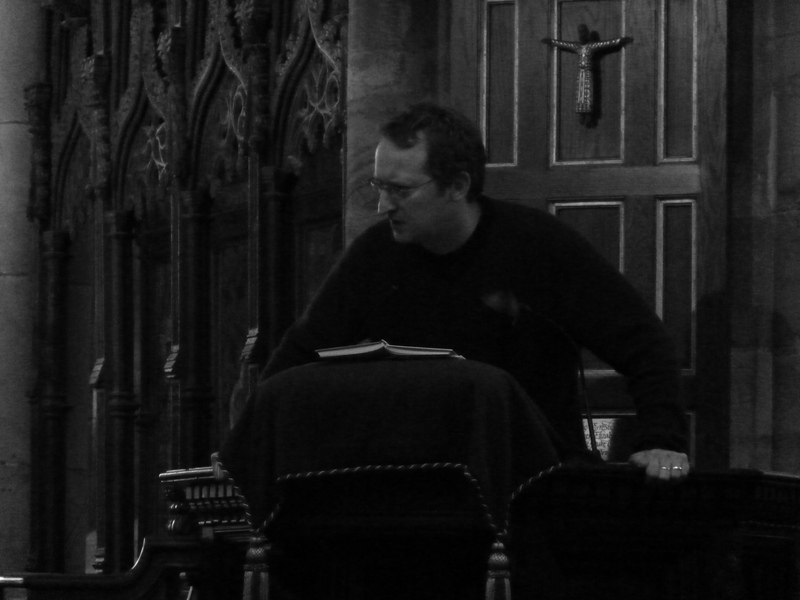 An early rehearsal – April 2012- for June’s The Crucible. 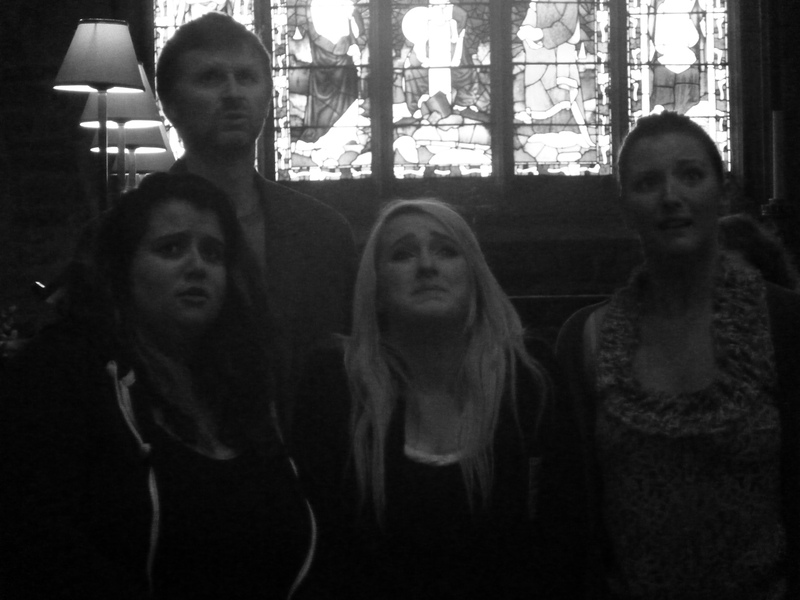 Working with such a talented and committed cast between April and June 2012 was a real highlight of the year. Explosive moments, such as the one pictured in rehearsal here between Proctor and Abigail made the production very special. 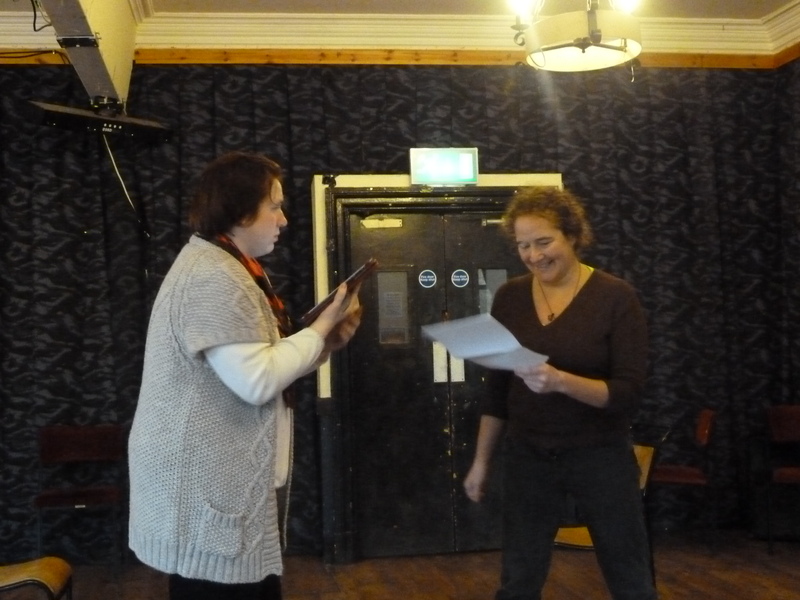 Rehearsing Act 1 in a different rehearsal room. May 2012. Working hard in the priory cafeteria! Some of the fabulous girls – and the equally fabulous Proctor! 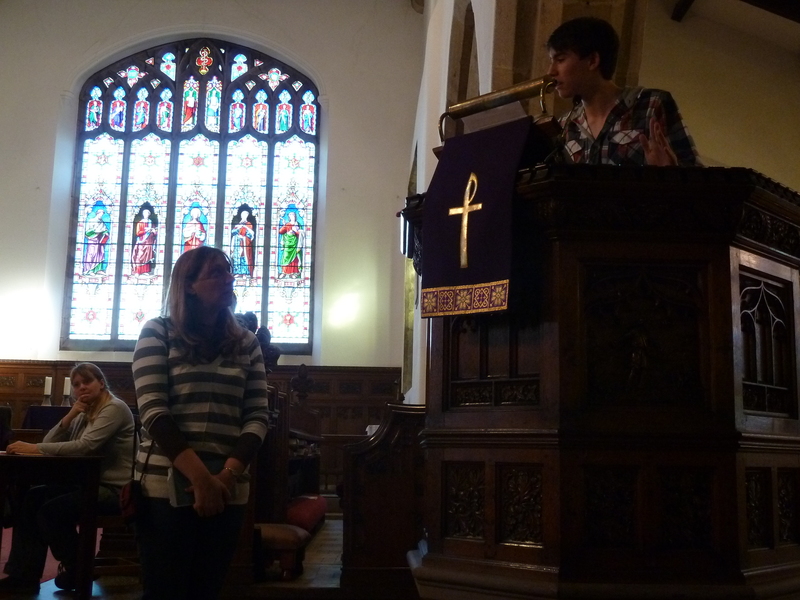 Placing Danforth in the pulpit worked well, allowing him to dominate proceedings in Act 3. 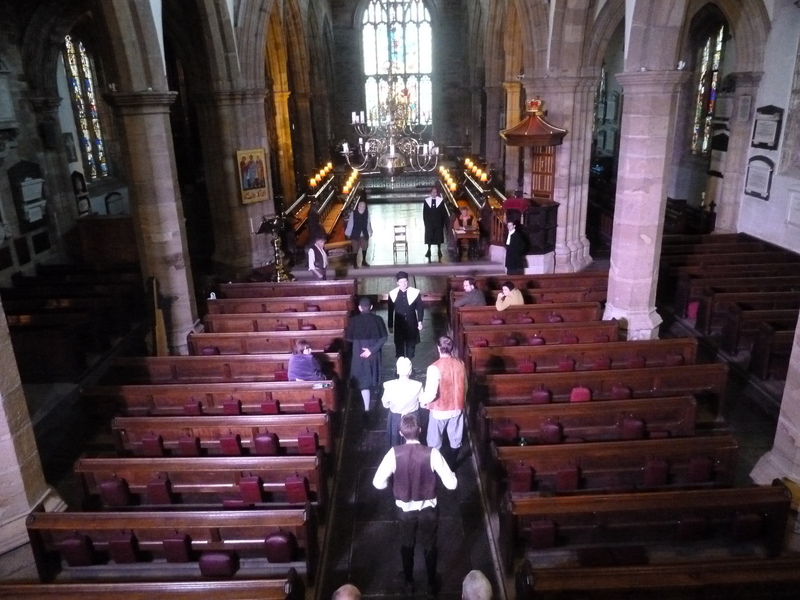 The whole priory in use as the court springs to life in Act 3. There were challenges in using the priory space, but also some wonderful bonuses, such as this fantastic shaft of light illuminating Abigail as she is confronted by Hale. The whole cast and crew – a fantastic group of people! A quieter summer followed, and then in autumn things got going again. The next production with photographs had the largest cast of the year – two casts, in fact! 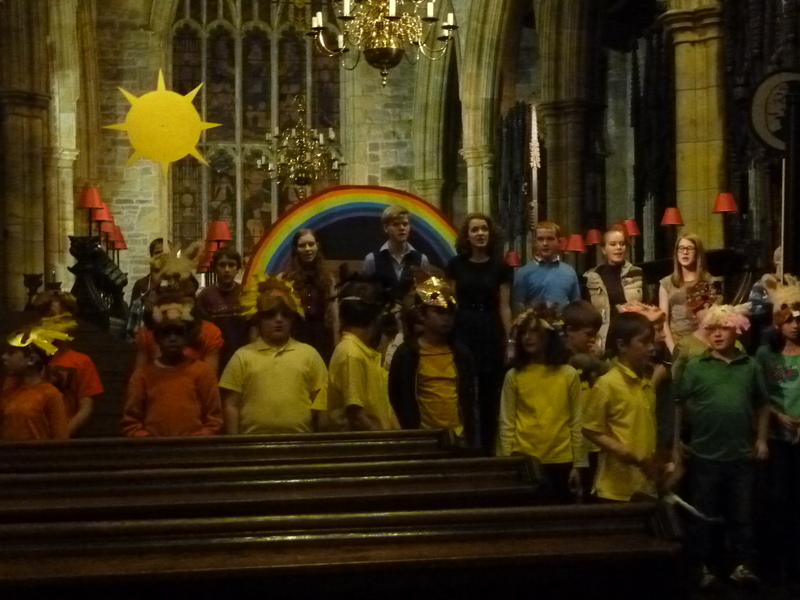 It was a youth production of the opera Noye’s Fludde by Benjamin Britten and alongside a core of teenagers, who played the lead roles, were two teams of over 30 primary age children, who played the animals at alternate performances. A good, if hectic, time was had by all! 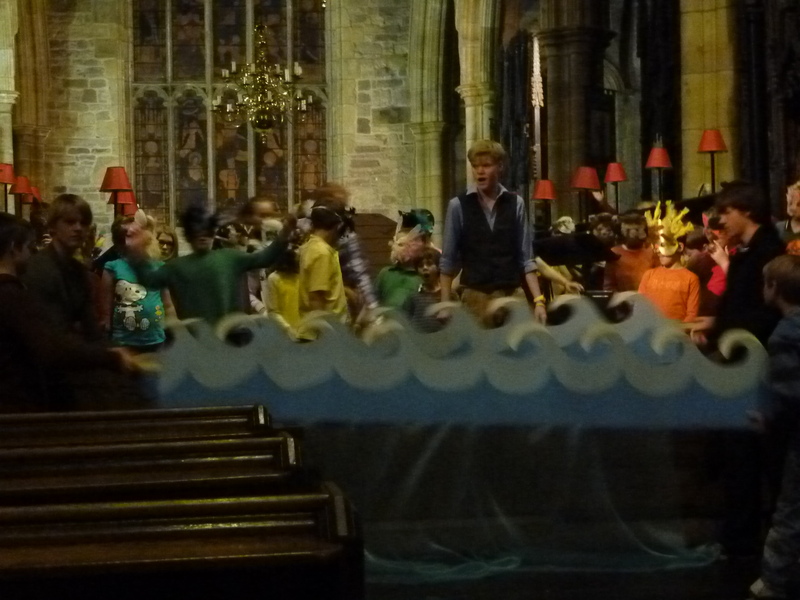 The whole show was medieval in design and these wooden waves (handled by stage crew) worked beautifully in the storm sequence. At the end, as well as a wooden rainbow, sun and moon, the children moved into colour groups according to the colour T-shirt they were wearing, and became the rainbow themselves. And finally, we come to last night’s Theatre Uncut show, which seemed to be a great success. The audience was certainly appreciative, and the seven shows fitted together very well, with only minimal scene shifting needed. This allowed the evening to flow and really gather momentum in a satisfactory way. Ama and Lou in prison. An intimate moment of persuasion – one of my favourite parts. And there it is. 2012. A huge thank you to anyone who has been involved in any way at all – and to all who have supported the shows. All ideas for future projects gratefully recieved; all considered. 2013 – Bring it on! Anyway, this is my review of 2012, part 1. Why review now? Well, it struck me this morning that tonight is (probably) my final show of 2012. It’s a 9 minute two-hander for Theatre Uncut – very simply directed to fit in with six other plays on one bill and I’ll be spending most of the afternoon at DT3 at The Dukes working out the technicalities and how to swap from one play to another etc. It should be fun! It also struck me that I’ve done a lot of shows this year – in a large number of venues: two spaces in the Dukes Theatre, two churches, the Ashton Memorial and others… – and it would be good to reflect on them. A Review Part 1, then, will be a series of photos to give a flavour of the year, and Part 2 (hopefully tomorrow) will include more detailed reflection and some more pics. Hope you enjoy them…. The Play’s the Thing! 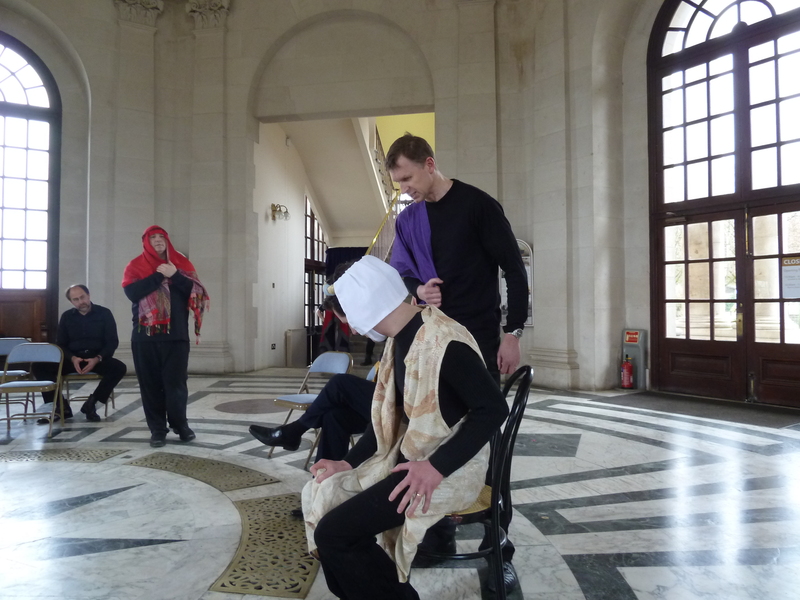 Actors rehearsing in the Ashton Memorial. March 2012. 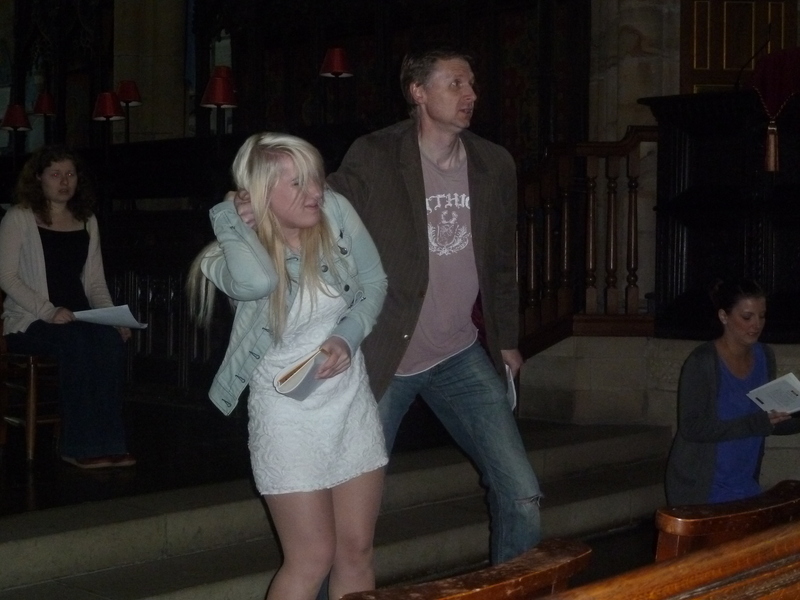 Rehearsals for The Vigil in Warton Church – including me acting (not a pretty sight!). March 2012. 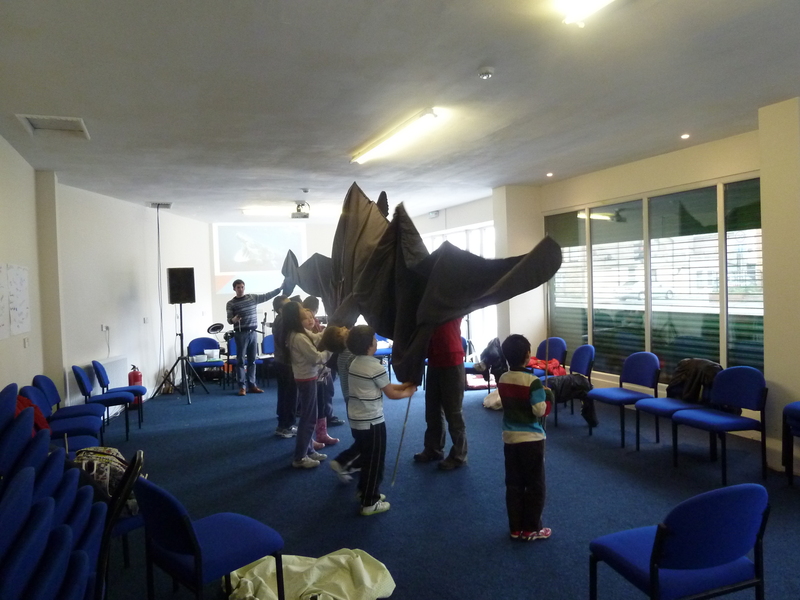 A one-day young people’s drama workshop for a Morecambe sea wildlife organization – complete with full size replica basking shark. Huge fun! April 2012. 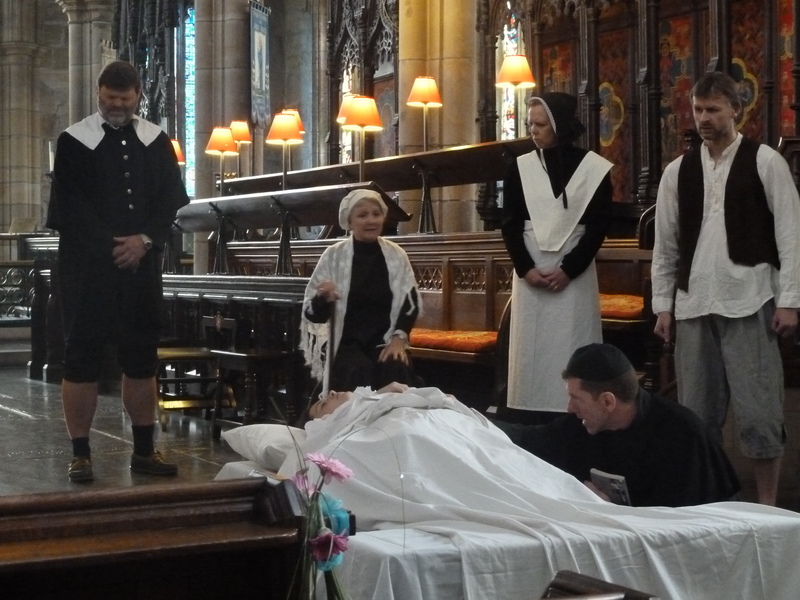 Dress Rehearsal for The Crucible – showing the great use we were able to make of the fabulous Priory space. June 2012. 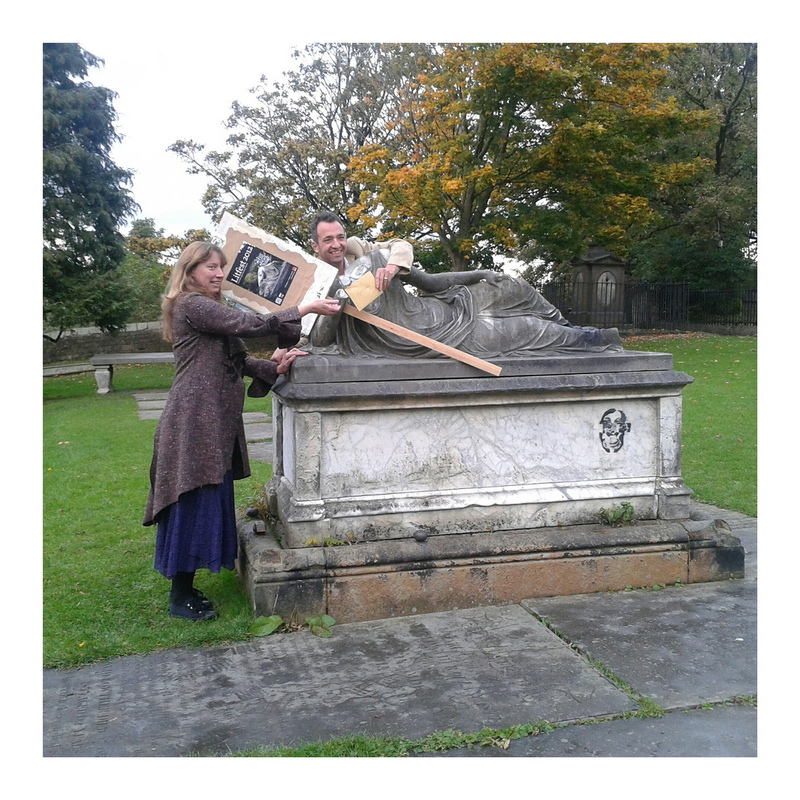 This was the presentation of the Litfest Mystery Launch theme 48 hours before the event. How self-conscious was I having this photo taken…! October 2012. 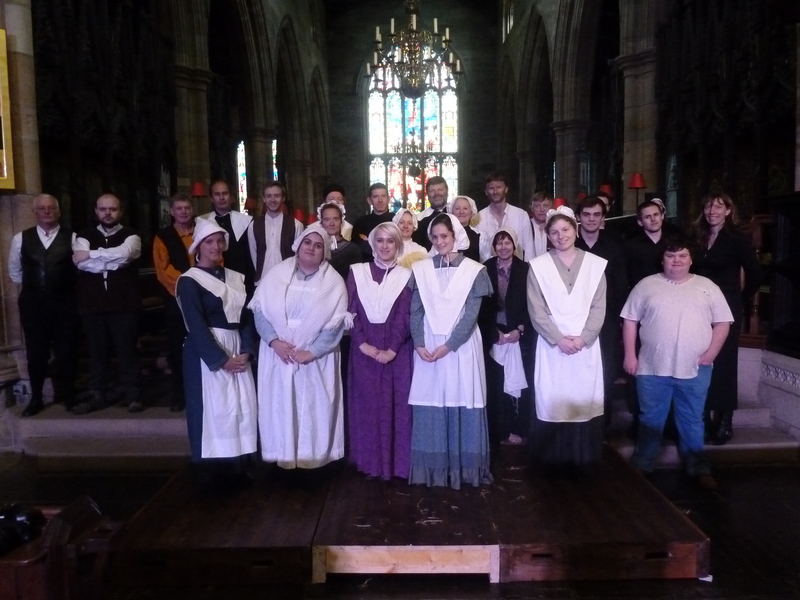 Dress Rehearsal of large youth production in Lancaster Priory – exhausting, but fun! October 2012. Rehearsals earlier this week for show tonight! November 2012. Whew! A few workshops etc missing, but the above represent 2012’s main events. It’s been a really busy, fun year. Thanks to all who have been involved in any way at all. Off to the theatre for tech now….